As a rule, limb discrepancy over 2 cm influences a person's life style in a negative way. This is an indication for surgical correction. The correction of the discrepancy is accomplished using the internal method, the same method as is used for cosmetic limb lengthening for patients of short stature. Pay attention to the surgical incisions. They are in the healing process (30 days after the surgery). Patient A had an 11.7 cm (4,6 inches) discrepancy due to a bullet wound sustained to his femur in 1984 (Afghanistan). The surgery for this particular patient was complicated due to extensive scar tissue, which had resulted from a fire wound and several prior surgeries in military hospitals. 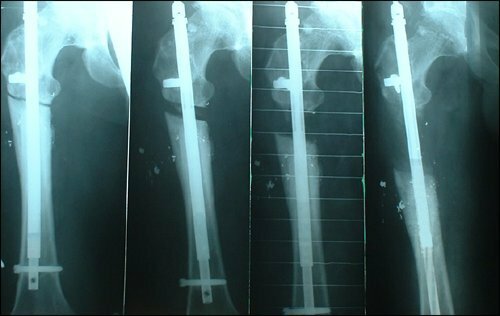 The result: Patient A received an 11.4 cm (4,49 inches) lengthening of his right femur. Before correction program. The discrepancy – 6 cm (2,36 inches). Status in one year. The correction of the discrepancy – 6 cm (2,36 inches).